First-time visitors to the new Social Security Building in Birmingham, AL, can’t help but stop and gaze. Floating above them, an undulating ceiling with a brilliant copper finish wends its way along a second-floor mezzanine, journeying past offices, picture windows and a sky-lit courtyard. 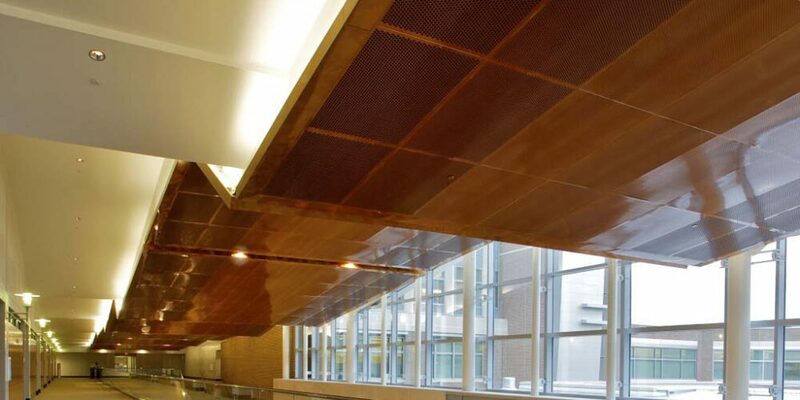 This award-winning suspended ribbon made of decorative metal sheets functions both as an arresting design element and a construction feature, concealing electrical, acoustic and interior sprinkler systems. Located in the new eight-story SSA Building in Birmingham’s historic downtown district, the unique ceiling is gaining national attention and recently won a Best of Competition Award for Construction Excellence for ceiling contractor, Steel Ceilings of Johnstown, OH. 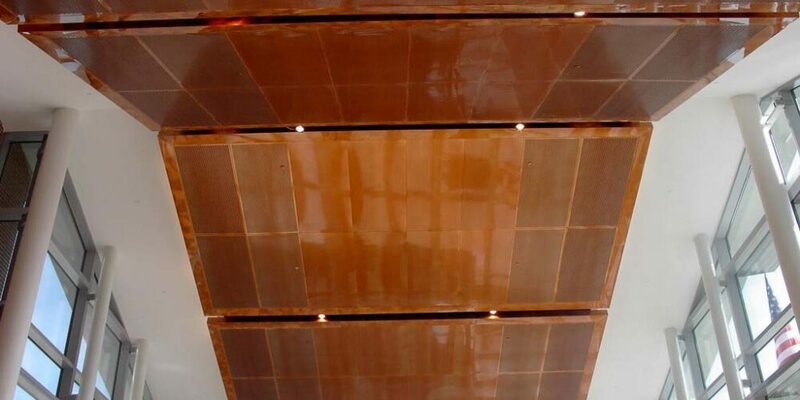 We shared the honors and supplied the copper-colored, solid core decorative metal sheets with reflective “Clouds” grain, transforming the structural element into a design triumph. Designed by HOK and built by Opus A&E of Atlanta, the 587,000 square-foot building was completed in 2007 and is leased exclusively to the Social Security Administration. With a sleek, contemporary design, Opus A&E fulfilled its goal of creating a high-profile office/lifestyle center that would help launch the redevelopment of Birmingham’s historic district. For SSA employees, the professional center is an all-encompassing mini-city with offices, daycare center, bank, retail shops and sky-lit food court. The suspended ceiling ‘floats’ throughout the public areas, cascading from the lobby to a busy mezzanine corridor that overlooks the mini-city. As pedestrians stroll along the corridor, light dances on the hand-etched surfaces, creating movement and iridescent reflections. 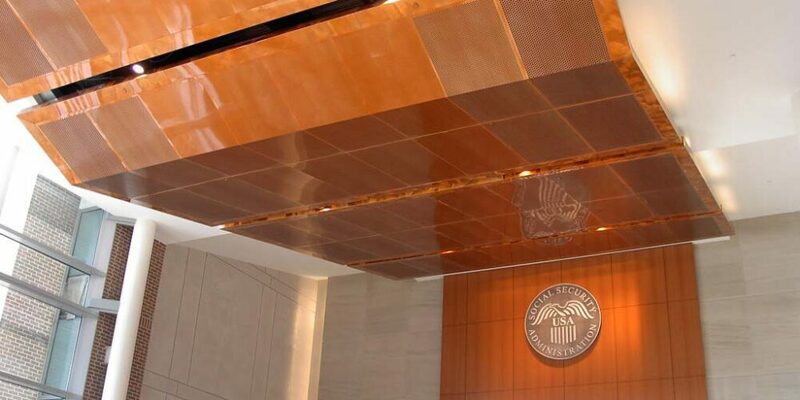 The 0.063-inch decorative metal sheets, copper finish and grain are standard, proprietary Móz products, which are custom-sized for this installation. Along the outside edge, we created a customized 10-inch perimeter trim to conceal the internal mechanicals. Throughout the ribbon, cut-outs were integrated to accommodate light fixtures and sprinklers. The Steel Ceiling torsion spring metal pan system proved to be a practical choice for architects seeking a fully accessible, yet concealed, structure. While appearing complex and technical, the ceiling was actually designed to be contractor-friendly. Environmentally-friendly, Móz decorative metal sheets contain 80 percent post-industrial recycled aluminum and contribute to LEED 2.0 MR Credit 4 – Recycled Content. All materials are also 100 percent recyclable at the end of their long, useful life with no loss of quality.